White horse and carriage waiting for tourists to trot around the older parts of town. The horse has a harness with flowers mounted on his back, blinders and a mouth guard. The town, whichever it may be, can partially be seen blurred out in the background. A lamp post, street, shrubbery and stairs are seen in the distance. 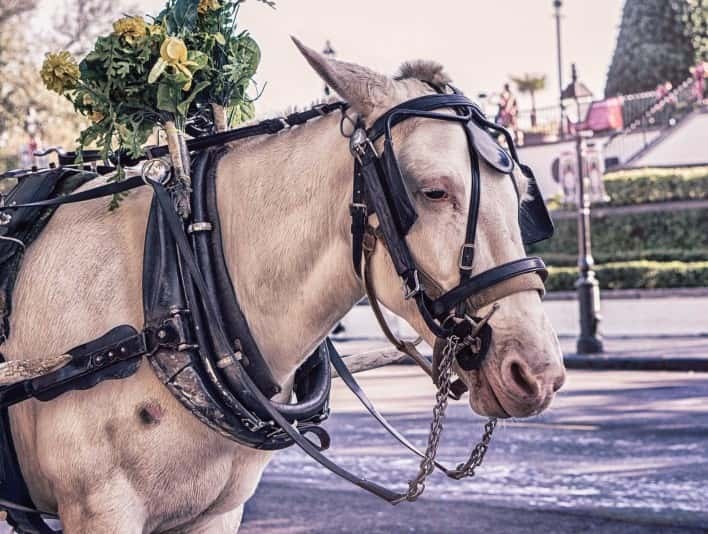 The horse itself appears to have a patch of har missing above the right leg, the flowers which are clearly fake and quite old are attached to the harness which wraps around the neck.